Amrita Vidyalayam school at Amman Nagar, Nesapakkam, KK Nagar West, Chennai is affiliated to the Central Board of Secondary Education, New Delhi. 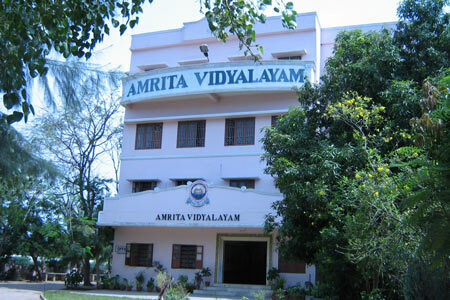 Amrita Vidyalayam, Chennai was started in 1990 in the Chennai Ashram premises with a strength of 20students.The school received its affiliation with the CBSE in 2001. In 1997, the school was shifted to the new school building, which was inaugurated by H H Swami Ramakrishnanda Puri , Treasurer, Mata Amritanandamayee Math. The Secondary section began in 2001 and the Senior Secondary Section in 2004. The school has more than 1600 students. School was recognized as the school encouraging the maximum number of participants in Inter school competitions. School has been performing quite well in the ASSET exam conducted by EI. Some of the students have come out with Out standing performance. This year also 4 students are at the top 5% level and 28 students are at the top 10% level. In the Cyber Olympiad conducted this year one of our 2nd std students has secured the 1st position in State level and 13th position at the National level. In Swimming one of our students has won 5 gold medals in the National CBSE swimming competition breaking 3 National records. She was given the Individual Championship and a special prize for breaking maximum National records. Students at the Class 12 level had won the Second Prize for the Best Poster Presentation in a competition organized at Electrochemistry department of Kalpakkam Atomic Power Plant .